Emotion, poise, voice and total immersion into the art of song writing, David Ramirez cuts the real deal figure of a guy destined to live by the means of the potent original song. Sweating out the passion of his deep rooted feelings via the medium of song took on both a literal and figurative sense at Tingewick Village Hall this evening. Maybe the heat was designed to replicate his Texas home, yet there was so much intensity in David’s performance there was little chance of a cooling impact on the audience. This was a performance hardened by the road, raucous joints and someone seemingly seeking solace in the wealth of their craft. Commercially and structurally, some will call this folk or Americana music; the reality sits with the bulging need of expressing feelings and finding out that you are rather good at this singer-songwriter game. The music of David Ramirez came to me from a multitude of directions since the turn of year. First of all seeing this unknown name supporting Angaleena Presley on her UK tour, getting respected recommendations from folks who caught him live and then ultimately buying his music after several sample listens on specialist radio and online music shows. The sound of David Ramirez, and the comparison with many iconic Texas singer-songwriters exporting their wares from the Lone Star State, gives you a little grounding before seeing his shows, but the live presence lifts this experience to a higher plane. Apart from being an exceptional record, FABLES turns out to be a very personal set of songs and this comes across in their presentation. To me ‘Harder to Lie’ is the standout moment on the album and the live version helped further embed the track as one of the songs of the year. Although the record made its US debut in August last year, the January UK release should see it get plenty of love with those never ending seasonal lists in a few months. Several other top notch tracks from the album were shared with the audience this evening including ‘Communion’, ‘Rock & a Hard Place’, ‘New Way of Living’ and ‘It Ain’t Easy’. Away from the new album, the tracks were largely unfamiliar, while still retaining a high level of intense interest. ‘Wandering Man’, from the ROOSTER EP possessed a memorable hook, while ‘The Forgiven’ was prefaced by an engaging story which brought the song to life. Likewise ‘Stone’ from the RAW EP lodged in the memory with a positive effect. 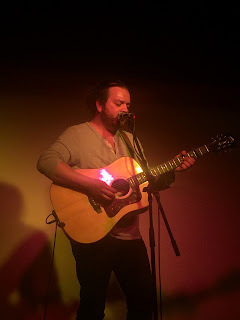 For the encore, David chose to cover the Ryan Adams song ‘A Kiss Before I Go’, politely asking the audience if they minded somebody else’s song after listening to nearly an hour and half of originals. While on the subject of crowd interaction, it was another case of an American artist slightly fazed by a silent but 100% respectful UK listening audience. However he adjusted positively and expressed gratitude to an environment surely welcomed by every singer-songwriter. The evening was concluded by David commenting on his forthcoming plans to make a new record and to definitely return to our shores next year. Hopefully, funds permitting, with a band. One thing for sure, with or without a band, David Ramirez will continue to impress many music fans who cross his path and are totally engrossed in the way he musically conveys the wisdom of his dedicated art. 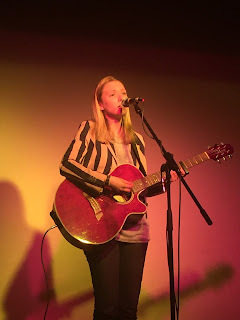 For this super evening presented by the ever popular team at Empty Rooms Promotions, young up and coming English singer-songwriter Hannah Scott opened up proceedings with a confident set of beautifully sung songs. She was not afraid to give an insight to her songs and reveal the family relevance especially in compositions such as ‘My Dad and I’ and linking the creative side to depression. More and more young home grown singer-songwriters are getting the opportunity to open for the established thoroughbred touring artists from the States. The standard does appear to be increasing and Hannah played her part in this perception. There does seem to be a buzz about David Ramirez in this country at the moment and he fits the mould of what many fans over here want in the shape of key high class American song writers who can span the spectrum from country to folk with a strong presence. Maybe he is just being true to his instincts and desires, but he can be proud that the music is connecting with an increasing number of fans. FABLES and this show have totally marked my card on the talent of David Ramirez.